Anticipation for Lionsgate's Power Rangers movie has never been higher, following the debut of the first trailer at New York Comic Con last weekend. Today we have word that the studio has launched a viral website that offers new details on these Power Rangers' civilian lives as students at Angel Grove High School. The website is actually for the school's official newspaper, The Roar, which showcases a few important students. 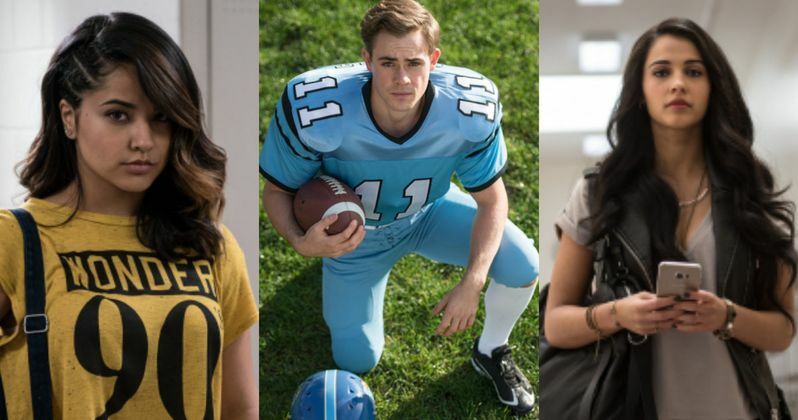 The website at AngelGroveHighSchool.com also links to the movie's official Instagram page, which features Dacre Montgomery's Jason Scott, a.k.a. Red Ranger, wearing a much different uniform. This photo features Jason in his high school football uniform as the team's quarterback, while The Roar website features Jason in their Student Spotlight section. This article reveals that Jason is an exemplary leader, who spends his weekends preparing for the next week of classes, so he can balance school work and football. The site also features a "New Student Spotlight" which showcases Becky G's Trini, a.k.a. Yellow Ranger. This article doesn't reveal much about Trini, other than the fact that she's accustomed to being the new kid in class, since she has relocated to new schools before. The article also encourages Angel Grove students to make an effort to meet the new student. There is also a story about the "controversy" caused by cheerleader Kimberly Hart a.k.a. Pink Ranger (Naomi Scott), who was seen walking around campus without her cheerleader uniform, which is apparently a rare event. This gossipy story goes on to address rumors that she has left her boyfriend and stopped sitting with two other cheerleaders at lunch. There is also a poll asking students to share their favorite fall beverage, along with a Snapchat filter and a story asking for students to share their "fall fashions" with the hashtag #HearTheRoar. There are no stories in "The Roar" about Zack Taylor, a.k.a. Black Ranger (Ludi Lin) and Billy Cranston, a.k.a. Blue Ranger (RJ Cyler), but perhaps they'll be showcased in the next issue of The Roar. There are also Staff and Arts & Entertainment sections on the site that will be launched in the near future. Power Rangers, which also stars Elizabeth Banks as Rita Repulsa, Bryan Cranston as Zordon and Bill Hader as Alpha 5, is set for release on March 24, 2017, under the direction of Dean Israelite. Take a look at the new Instagram photo below featuring Jason Scott in his Angel Grove High football uniform.